An Everybody’s Invited Wedding: Play, Surprise, and Adventure — Everybody's Invited! Back in April, Tara shared some details about my wedding on this blog, and now I’m finally ready to follow up with some more photos and to share a bit about the thinking that went into it. Like most couples, my husband and I knew we wanted the wedding to reflect some of our core values and our shared interests. And like me, my husband is really into play, surprise, and adventure, so we were able to group a lot of our ideas into those buckets. This was easy. We had a game room and used the opportunity to grow our game collection a bit. We knew we needed games with a low barrier to entry—no one was going to sit around and parse the rules to Settlers of Catan, but anyone can jump into a game of Jenga. My husband and I spent about 30 hours making the word PLAY out of LEGO letters. It was a multi-step process—sourcing the LEGOs (we spent hours picking through bins of random bricks), washing them, determining the color pattern (we tried at least three different patterns), and finally designing our font and figuring out how to construct the letters in such a way that they wouldn’t be so top-heavy that they’d fall over (the P was particularly problematic). And we gave tangram puzzles as our favors. My mother-in-law and her partner made them, and they are awesome. We wanted an unusual unity ceremony, and we also knew we wanted it to be science-y. There’s an obvious connection between the “chemistry” a couple has and actual chemistry. So we purchased 50 glowsticks, cut them open, and separated out the two liquids inside. There’s a colored liquid contained within a vial in each glowstick, and a clear liquid surrounding the vial. When mixed together, they glow. Science/Love! We hope the effect was a fun surprise for our guests. From the beginning, we wanted a BIG surprise at some point during the evening, and we spent hours hashing out crazy ideas, but nothing stuck for a long time. About two weeks before the wedding, we finally hit upon an idea that we thought might work. The catch was it would involve the talents and goodwill of three of our friends. Luckily, Eric, Chad and Trish were totally game. After dinner, Eric stood up and pretended to interrupt the toasts. He set up a rather far-fetched premise involving evil overlords from the future, time travel, and the fact that this wedding was somehow critical to the future of humanity. Eric hammed it up and had the rest of the guests laughing and cheering. After we’d managed to “save” the future (I won’t go into details about how, but it involved invisible ink pens), our friend Chad surprised everyone again by standing up and claiming the crisis wasn’t actually averted. 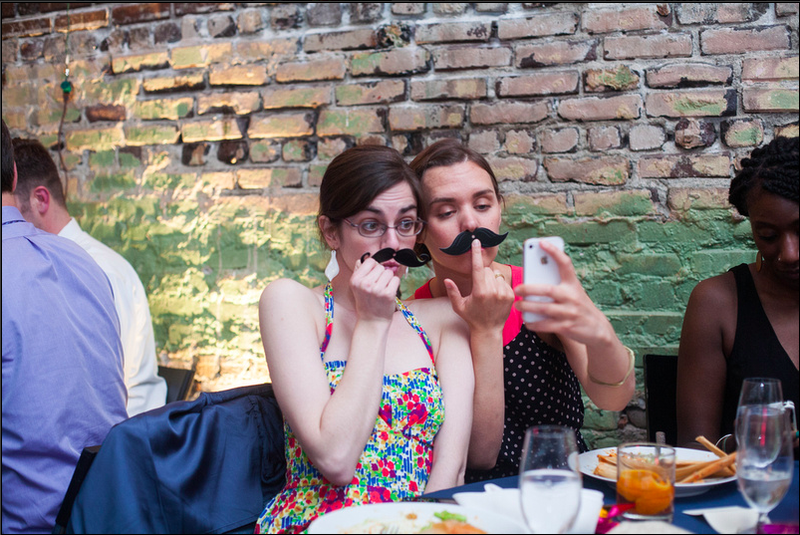 This time, we all had to take photos with plastic mustaches in order to save the world. We’d planned from the beginning to surprise our guests with a sudden costume change and a well-rehearsed tango, choreographed by the incredible Sydney Weir, formerly of Fred Astaire Dance Studio in Portland. Once we thought of the time travel skit idea, we had a way to raise the stakes on the dance. Now, we weren’t just dancing to celebrate our wedding, we were dancing…to save the world. I’d been really nervous about the time travel skit idea. I thought it had the potential to flop. But I should have known that Eric, Chad, and Trish had the chops to pull it off. Looking back, this was absolutely, hands down the highlight of the wedding for me. I love that we had this chance to improv with our friends, surprise our guests, and take a risk (play, surprise, and adventure – all in one! ), and I LOVE our friends for being so amazing, creative, funny, and totally up for anything. We haven’t planned a honeymoon yet, so we thought it would be fun to crowdsource our plans. We put up a map of the world and let people pin places they think we ought to travel. The day after the wedding, we planned a few adventures for people who were sticking around. We went on a chocolate factory tour (adventure + learning!) and we went kite-flying at Gasworks park. I don’t have any pictures from that day, but I do have this picture from the same kite-flying spot, taken the day before. It was, obviously, an incredible day for me. I am so grateful to my friends and family, and of course my wonderful husband, for helping to make it happen and for sharing it with me. Let us know if we can help inject some play, surprise, and adventure into your special day.